Often times owners would like a better service solution for their BMW then the services offered by dealerships in Tempe, Arizona. iAUTOHAUS is your answer. We offer all services when it relates to your BMW and we can service your vehicle quickly and professionally with our BOSCH Certified technicians. iAUTOHAUS has an enormous amount of experience and only uses the latest diagnostic tools to perform the work. We feel strongly that when you bring your BMW to iAUTOHAUS you will soon realize what a different service experience truly is. The iAUTOHAUS repair team is looking to exceed your expectations when it comes to servicing your BMW. iAUTOHAUS is here to assist all of your BMW repair needs! Our knowledgeable technicians have considerable experience with European and luxury vehicles— Audi, BMW, Jaguar, Land Rover, Porsche, Mercedes-Benz, Bentley, Maserati, Volvo, Volkswagen, Smart Car, MINI, Lotus, Maybach, Lexus, and more. As a BOSCH-authorized facility, we provide efficient service and stellar craftsmanship while constantly improving our quality assurance standards to ensure your vehicle receives the best possible service at a reasonable price. 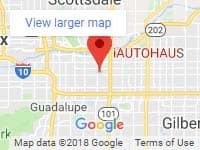 Trust iAUTOHAUS for Your BMW Repair and Maintenance Service Needs in Tempe, Arizona. Call (480) 317-0783 to Schedule an Appointment Today. At iAUTOHAUS, we strive to make your experience with us as hassle-free as possible. Our BOSCH service facility boasts a comfortable waiting area, complete with free wi-fi and a flat-screen TV. We also offer free towing with certain repairs, free shuttle service, and a complimentary wash and vacuum when we service your vehicle. To make auto care costs more manageable, customers are invited to finance them with the BOSCH Service Credit Card, which allows customers to take advantage of flexible terms and great rates. All of our services come with a 100% satisfaction guarantee. Entrust us with your auto care needs and discover why we’ve become one of the most trusted names in auto repair in Arizona. Serving Tempe, Arizona, and surrounding areas, we use the latest technologies and perform our work according to manufacturers’ standards. When you choose iAUTOHAUS for your auto care needs, you can have peace of mind knowing that our highly-qualified technicians will provide the prompt, professional service you deserve. Family-owned and operated, we have earned a solid reputation in the community and appreciate our many loyal customers. …and much more, of course. We take care of all your auto care needs in one convenient location. At iAUTOHAUS we are always on the lookout for European luxury vehicles in excellent condition. You will receive a fair offer and that quote will be good for 7 days. Perhaps you would like to use your vehicle as a trade in? Even better. Looking for a great Certified Pre-Owned luxury car? We have some terrific inventory at a great value for you to select from.